Latisana is a beautiful town in the province of Udine, on the border between Veneto and Friuli Venezia Giulia regions, along the left bank of the Tagliamento river. The city was founded in Roman times, as the predial origin of the place name reveals ( from "Atisius" or "Tisius", a Roman soldier who obtained a property in this area). In Medieval period it became a flourishing river port: its geographical position, in fact, allowed the exchange of goods and people from the Venetian lagoon to the Trieste coast. It was first under the control of the counts of Gorizia; in 1420 it passed under the jurisdiction of the Venetian Serenissima Republic until 1818. Today Latisana is one of the most important towns of the Bassa Friulana, due to its strong tourist vocation, the landscape and the proximity to Bibione and Lignano Sabbiadoro. - the Cathedral of San Giovanni Battista, former abbey church, was built in Medieval times; it was later renovated both in the XVI century and in the XVIII century. Today it is characterized by classical forms, it has one nave with six side chapels with marble altars and paintings of the XVI-XVIII century (by Giobatta Grassi, Paolo Veronese, Marco Moro). The XVIII century organ, made by Pietro Nacchini, is very interesting. 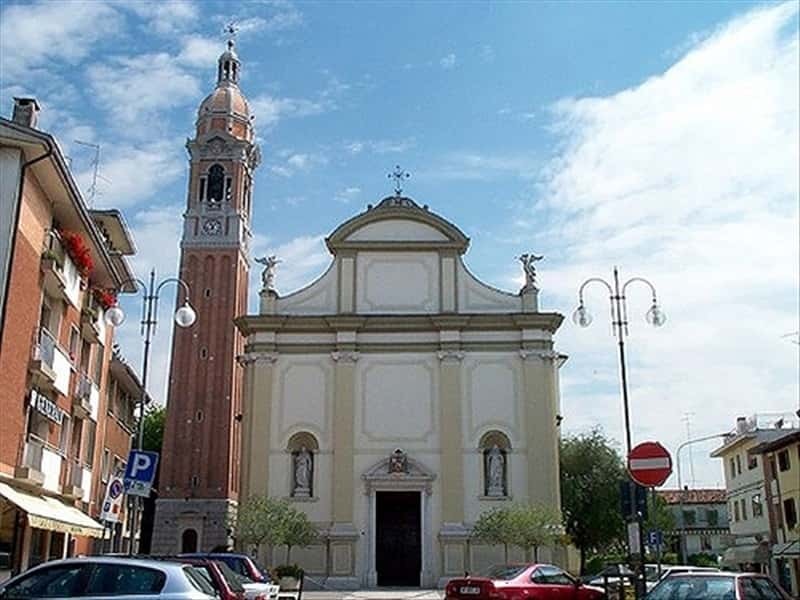 - the Church of Beata Vergine delle Grazie was built in the XVI century in Sabbionera, near the Tagliamento river. The history of this church was linked for about 130 years to the adjacent convent of the Franciscan fathers, suppressed by the Venetian Republic in 1769. It has a XVIII century wooden altar by Antonio Mozzon, the wooden statue of the Holy Virgin by Giovanni Costantini (1914) and an altarpiece depicting the Virgin, St. Luis and St. Claire (XVII century). - the church of Sant'Antonio from Padua, once belonging to the Franciscan monastery suppressed in 1810. The façade has three statues representing the Holy Virgin, St. Antonio and St. Francesco. The beautiful altarpiece by Cappella, representing the "Transito di san Giuseppe, Madonna con Bambino, Sant'Antonio di Padova e Santa Chiara" is on the main altar. The bell tower has an onion dome and a mechanical watch of the XVII-XVIII century. - the Gaspari Temple, funeral chapel built by Rosa de Egregis Gaspari in 1856 for her husband and son. The building was projected by the architect Andrea Scala with classical forms. - the tourist complex of Aprilia Marittima. This town web page has been visited 13,070 times.